Class of 2017 Phi Beta Kappa induction ceremony. In 1916, Randolph-Macon Woman’s College became the 88th institution in the nation—and the first woman’s college in the South— to become a member of Phi Beta Kappa, the nation’s oldest and most prestigious academic honor society for the liberal arts and sciences. 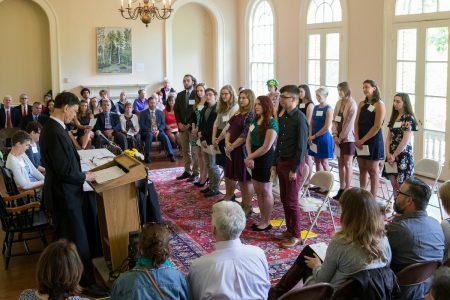 Today, Randolph College continues to induct its highest quality graduates into the Delta of Virginia Chapter of Phi Beta Kappa, which is currently celebrating its 241st anniversary through Keys to Action Week. Over the years, around 1,300 Randolph alumnae and alumni have received the honor. The College initiates around 10 percent of each graduating class based on the society’s guidelines, which is generally about 12-15 students. The first inductees were 1917 graduates Cornelia Frost, Florence I. Kehr, Catherine Hunter Nuckols, Henrietta Peery, and Mary Louise Petrie. Fourteen graduates in the Class of 2017 were offered membership. To be offered membership, students must meet the requirements for a solid liberal arts degree, have achieved a certain number of credits at Randolph and a minimum GPA, and meet the requirements for math and language. “Randolph students offered membership in Phi Beta Kappa are very strong academically and tend to have other attributes that suggest they have been identified as good citizens within the community,” said Kim Sheldon, director of student success. Phi Beta Kappa was initiated as a society on December 5, 1776 by five students at the College of William and Mary in Williamsburg, Va. Yale and Harvard were granted charters prior to the Revolutionary War, and chapters grew during the 19th century. Today there are 286 chapters, and only 10 percent of U.S. colleges and universities are members. 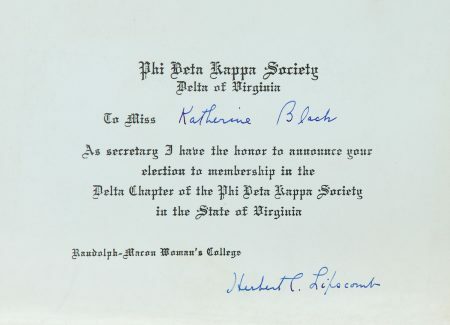 This Phi Beta Kappa certificate was awarded to Katherine Black in the early 1900s. “The Senate took favorable action upon the application, and included Randolph-Macon Woman’s College in the list of institutions recommended to the next session of the National Council as worthy of charters. The first battle in behalf of the coveted honor was won, but in view of the fact that a successor to Dr. Smith who had passed away during the preceding November, had not been elected, Drs. Lipscomb and Laubscher, at the suggestion of the secretary of the United Chapters, requested that that application lie over without prejudice until the Council of 1916, and this action was taken.